Russia: 23 of February – Defender of the Fatherland Day! Hello- Friday this week (Feb. 23rd, 2018) we have traditional Day of Man in Russia. It’s official name is Defender of the Fatherland Day. From my Soviet childhood I remember this day [A Day of Soviet Army and Navy Day]. This day we congratulated our men-teachers and our boys class-mate [because all men suppose to served in the Soviet Army at least for once, and all boys were considered like defenders of Motherland in the future]. That was a Soviet tradition what we still follow now. And even so we don’t have Soviet Union and Soviet Army anymore we still have this tradition and honor our men. We appreciate that people who took away another Soviet holidays, allow us to have this one. 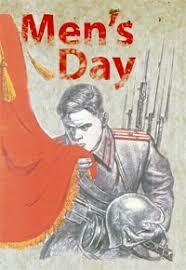 They renamed this holiday to Defender of the Fatherland Day and I think that is a very good name! Yesterday we had a small office party for our men at work. Year by year we make a little concert to honor and congratulate our colleagues-men. That is not very easy to make something special for each of them because they are 90% of our IT Department, but our colleagues-men always appreciate all what we do for them at 23 of February. How we know it? Because they congratulate us very warm and nice at the 8 of March (INTERNATIONAL WOMEN’S DAY) 🙂 . Best wishes for all! I wish be strong, wise and healthy to all men who read our blog. Because every man is defender he was created to be 😉 . And for me 23 of February is a Day of Real Men! It does not matter in what country they live, all of them have a nature to be defenders of their families. And when their countries are in danger they would go and defend their countries and their family what lives there. So I wish you all Peace and I wish wisdom for Rulers of our countries to keep this world in Peace.